Ideas in Profile: Small Introductions to Big Topics In a world that is constantly changing, understanding the world has never been more important. But by thinking in neat segments, we miss the big picture. When economists think about globalisation, they often see trade; politicians see institutions and power; artists see a new global aesthetic. Social theory is what sees them all together. Renowned theorist William Outhwaite takes us on a journey through the major thinkers and topics of this often misunderstood discipline. We move from the the work of Rousseau to the still powerful insights of Marx and on to the great sociologists, Weber and Durkheim. We probe the big questions - why is religion powerful, where does capitalism come from - and move through the key ideas of the twentieth century thought from the Frankfurt School to Bourdieu and Giddens. 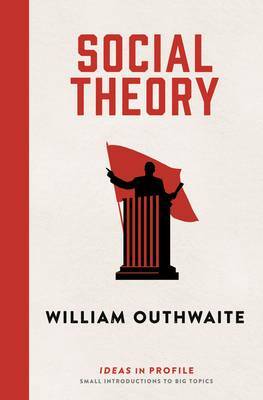 Lastly Outhwaite questions the role of social theory today. Where does this vital discipline go next and how will its wide horizons help us stand up to the challenge of the twenty-first century?